I had an intense craving for binagoongang baboy the other day,but living in a high rise building constrained me not to cook it. First off, I didn't want to get our whole place smell like bagoong (shrimp paste) and second, the smell might sneak out into the other units. Being a new resident around here, I'm pretty sure I will be the first suspect of where that pungent smell is coming from. But the craving was intense, and I haven't found any Filipino restaurants in St. Louis yet. My only choice to satisfy my craving was to cook this dish on the sly. Don't ask me how I did it. 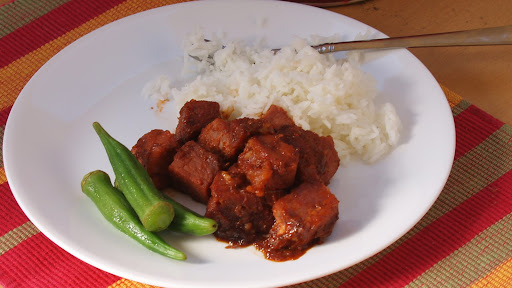 But when my husband came home from work, he was surprised that I served him binagoongang baboy. So how did you cook this? he asked. His upper lip was tight and his voice was low. It was as if I committed a crime! W-h -y does it smell? I asked. Ok case closed, Let's just enjoy dinner I said. And we sure did! It was literally and figuratively a heart stopping dish, although I would think that you have to be a Filipino to enjoy it. 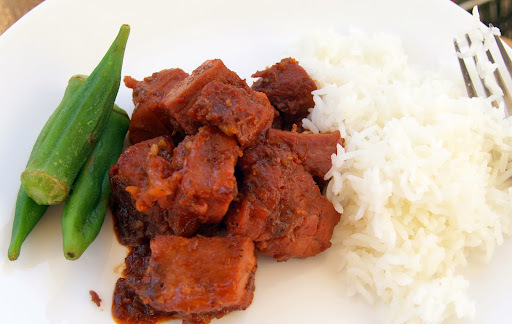 However if you are an adventurous eater, go ahead, I invite you to try our binagoongang baboy. When cooking pork, I usually parboil it first. So put the meat on a pot, fill it up with water until meat is covered. Let it boil for a few minutes. Drain the pork and set aside. Saute onion, garlic and tomatoes add the bagoong give it a quick stir. (this is when your neighbors might close their windows haha) Add 3/4 c water and let it simmer. Add vinegar (don't stir until it boils) bring in the pork. Cook for about 30 minutes or until pork is tender. Add ketchup and sugar. You may add more bagoong or more sugar depending on your taste. Let it simmer until the sauce is reduced. Serve with rice... mounds of rice. And to balance off the saltiness, blanched okra on the side is best. Ok, even without cooking it, i could smell it already over here. Now I'm the one who has the craving for it. Now what Malou? haha! I haven't cooked this yet but for sure will do it. Ill share it with you once I cook it ok? Now I would like this for dinner tonight and it's your fault! Haven't had this for a while. However did you manage to make this without the house smelling like bagoong? It looks delicious! This is defitely "to die for" ! Must make this. Thanks for the recipe and the inspiration. I'm drooling now, Malou! Ha haaa, I enjoyed your story on how you magically produced this dish without your husband knowing how it came to be. Its always so fun to pull something like that off! I would love to try this dish, its so beautiful and vibrant and sounds delicious! I sooo love pork binagoongan esp. the crispy version, but I don't get to cook it that often because my daughters hate the smell. Nami: I know right? there are not much Filipino Restaurants around... hopefully that landscape will change soon. Jenny: thanks for stopping by again. make sure nga to let me know how it goes. Tita Flips: you could have this anytime over there right? Glad to see you! Betty Ann: haha you could cook it for yourself though so drool not haha. Ryan: yep it's called the magic of scented candles and spray. I love surprising my hubs, he thinks I'm a wizard in the kitchen. Tina: I would like to try the crispy version too. I haven't tried it yet and yeah cook it when the kids are not around. It's 8 am on a Saturday, I saw a tweet of your link, I clicked it and now I'm craving binagoongan. I was craving for pancakes this morning. Maybe waffles with fried egg and bacon. But now. I want that plate of okra and binagoongan and plenty of rice. maybe a fried egg, too. Happy weeken, Malou! Hope you are enjoying SLT. Hi Malou! Thank you for checking my blog, Filipino Recipe Reviews, and leaving a comment. I am thrilled to receive a comment from you! Your blog is fantastic and your stories are funny and heartfelt. Great bloggers like you is an inspiration to newbie bloggers like me. 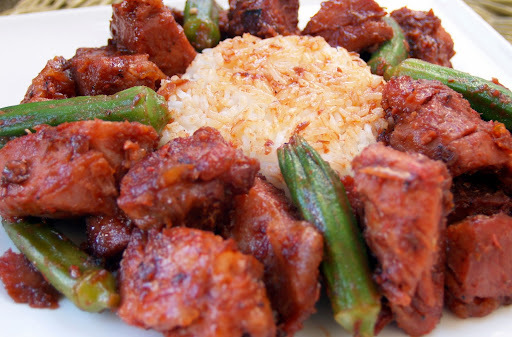 Your pork binagoongan looks really good! I will definitely try your version. Hope you enjoy my posts and continue following my blog. 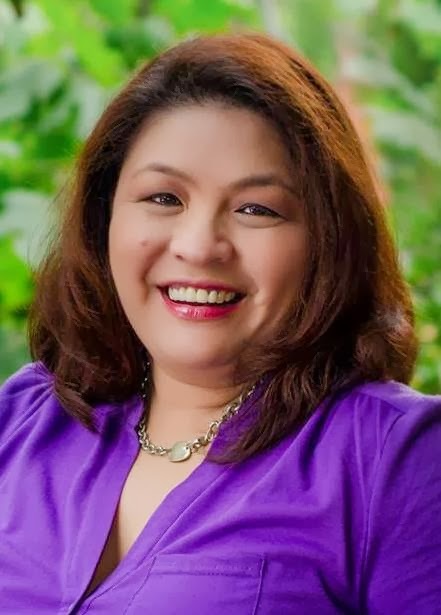 More power to you and Skip to Malou! i've been looking for this recipe for like ages. I'll try yours one day :-) thanks!